Rice University’s Jesse H. Jones Graduate School of Business is one of the university’s seven academic units. The school was named after the late Jesse Holman Jones, a prominent Houstonian and world-renowned business and civic leader. The school received its initial funding in 1974 through a major gift from the Houston Endowment, a philanthropic foundation established by Jones and his wife, Mary Gibbs Jones. Rice offers four MBA programs: full-time MBA, MBA for Executives, MBA for Professionals, and in July 2018, Rice will welcome its first online MBA class, MBA@Rice. The Rice MBA Program is accredited by AACSB International. Rice University’s main campus is located on a 295-acre campus in Central Houston, Texas. The university is situated near the Houston Museum District and adjacent to the Texas Medical Center. The main campus is located less than 15 miles away from the Hobby Airport and around 25 miles away from the George Bush Intercontinental Airport. The Rice University MBA program is housed in McNair Hall. The 160,000 square foot building was constructed in 2002. The ground floor of the building has amenities such as a 208 seat dining room, student, faculty and executive lounges and the 460-seat Shell Auditorium. The second and third floors house the School’s library, classrooms, and faculty offices. The El Paso Corporation Finance Center is one of the academic facilities available for Rice MBA students. The center is equipped with a variety of tools to train students for future careers in finance. This includes workstations with video conferencing equipment, a variety of high-tech monitors, TVs and projectors, and resources including Bloomberg Professional, CountryWatch, and Capital IQ. The Gilbert and Ruth Whitaker Business Information Center is also open to Jones students. The library occupies the second and floor of McNair Hall. It includes a room for reference materials and journals, a separate room for the circulating collection, and a large reading room. The information center also features several group study rooms, carrels, and online resource rooms. The faculty at Rice are highly accomplished, with professors in the business department being known for their numerous publications in scholarly journals. There are nearly 70 full-time faculty members working in the business program, with 33 having tenure status. Academic areas that they teach include accounting, communications, entrepreneurship, finance, marketing, organizational behavior, and strategy and environment. The Rice University Jones Graduate School of Business enrolls 676 MBA students, with 228 full-time, 331 part-time, and 117 EMBAs. 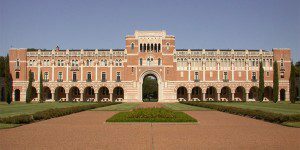 Rice University features four MBA programs: full-time MBA, Executive MBA, Professional MBA, and MBA@Rice, a brand-new online MBA. There are also dual degree options available, such as the MBA/ME, MBA/PSM, and MD/MBA. What Are the Fastest MBAs You Can Earn in Houston?